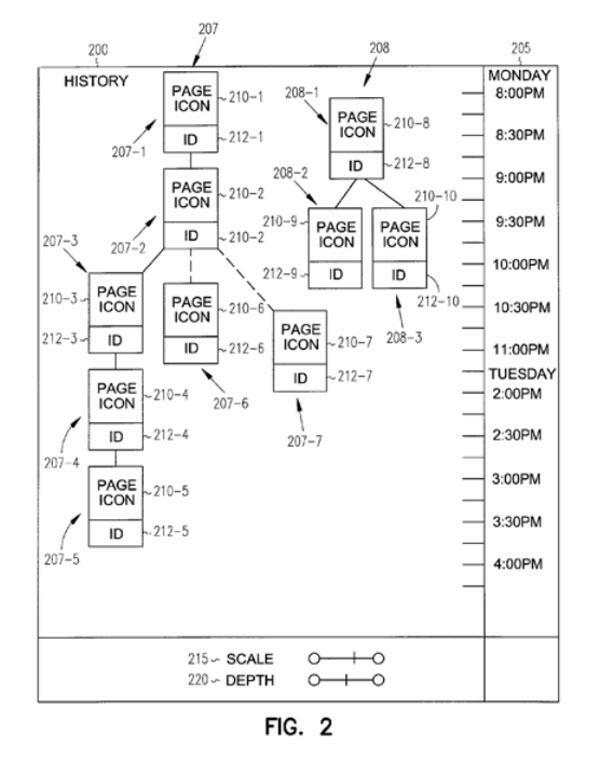 A pair of new patent filings from Apple include suggestions for improving the browsing experience offered through its Safari Web browser, such as a adaptive media support and a visual history tree that more accurately shows users where they've been and how they got there. Both filings are relatively fresh, having been filed in January and April of this year, respectively, and each are credited to known members of the Cupertino-based company's Mac OS technology and QuickTime teams. Of particular interest is the filing for improved navigation history display, which suggests that a user's browser history be presented in the form of a visual tree diagram tied to a timeline, rather than as a linear list of previously accessed pages that otherwise lacks structure. "A problem with this linear history is that users can visit a large number of web pages, which are confusing to view in a linear history, and the forward and back buttons are inefficient and cumbersome way to navigate through multiple web pages," Apple said. "Further, the problems of a linear history are not confined to pages accessed via a web browser, but also apply when a succession of data of other types is accessed over a period of time." To remedy these issues, the company proposes a signal-bearing medium where previously-accessed web pages are displayed as nodes in a tree (or trees) alongside an axis representing time. Under this model, the root node of a tree would represent a webpage accessed manually when the user enters an address into Safari's address bar, while a child node of the tree would represent pages later selected from the parent node. The tree would split each time the user spawns a new window or tab and represent this split to the user through variations in the lines connecting the tree nodes. The new history interface would also include controls for scaling the tree by time of depth, as it's likely that users will visit a large number of web pages during any given session. "Compression reduces the number of displayed nodes by only displaying, for example, nodes associated with pages that have an address with a hierarchical level corresponding to the position of the depth slider," Apple said. "When the depth is set at zero compression, all nodes are displayed. When the depth is set at maximum compression, only nodes associated with an address at the first hierarchical level are displayed." In the second filing, Apple looks to solve the problem where Mac users are sometimes prevented from viewing digital media —primarily videos —on the Web because Safari lacks the means required for display of that media in its preferred format. "In web browsers other than Internet Explorer, it is up to the Web browser to find a registered plug-in for use based on the media type specified in the HTML," Apple wrote in the filing. "In these examples, a Web browser must either determine whether there is an appropriate plug-in or must use a single specified plug-in which may not be available. If it is not available, the media content cannot be displayed or otherwise presented." 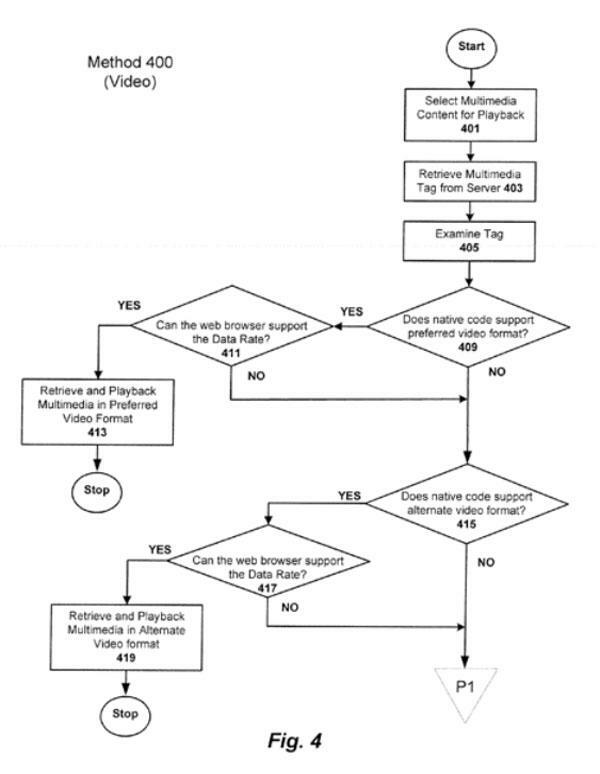 As a solution, the company proposes that Safari examine metadata included with the media item to determine whether the content can be displayed in an alternative format supported natively by the browser, or through plug-ins that could retrieved and installed on the spot. "The preferred from or representation may be specified first and examined first and if the user agent is not able to support the preferred form, then the user agent may examine the rest of the tag or metadata to determine what other forms or representations it can support," the filing says. "The other forms or representations may be characterized as fallback positions or forms. In addition, the tag or metadata may specify other parameters or conditions, such as bandwidth or data rates, which can be used to select which form of the content to present."